FHM 5 delivers new community-requested features including dramatically improved tactics, an all-new interface, player and staff personalities, new team chemistry, accurate 2018-19 season rosters, online leagues and more! The NHL® season is underway, and there's no better way to celebrate than by purchasing the all-new Franchise Hockey Manager 5! Own The Ice and Etch Your Name with the biggest and most fun version of Franchise Hockey Manager we've ever made. Franchise Hockey Manager 5 is the only sports strategy game licensed by the NHL ® , including the real clubs, awards, and trophies associated with the greatest hockey league in the world. 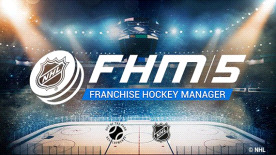 FHM 5 allows you to build your hockey franchise into a perennial Stanley Cup winner YOUR way, in the current 2018-19 season or back through the entire history of the sport - all the way back to the very beginning! DIfferent eras demand different tactics, and it's up to you to put together the best club possible for every era. NHL, the NHL Shield, and the word mark and image of the Stanley Cup are registered trademarks of the National Hockey League. NHL and NHL team marks are the property of the NHL and its teams. © NHL 2018. All Rights Reserved.